The breathtaking landscape is the perfect setting for unforgettable rounds of golf in an environment of pure nature. 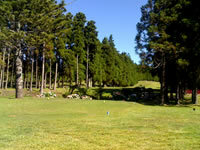 The Azores has the perfect weather to play golf all year around, due to the presence of the Golf Stream. We invite you to play with us, no rush, in a green environment, in the middle of the Atlantic Ocean, between Europe and North America. -The Western Group of Flores and Corvo. Here you can find the lowest green fees rates and the easiest and safest way to make your golf booking for your Azores golf break.